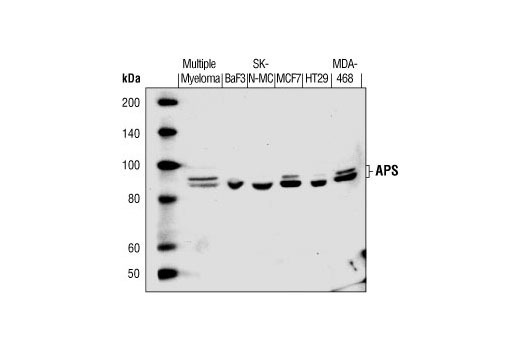 Western blot analysis of extracts from various cell lines, using APS Antibody. 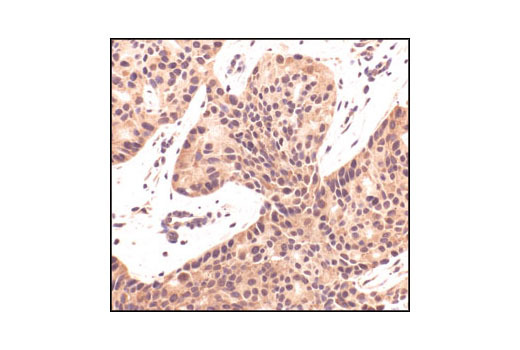 Immunohistochemical analysis of paraffin-embedded human breast carcinoma, using APS Antibody. 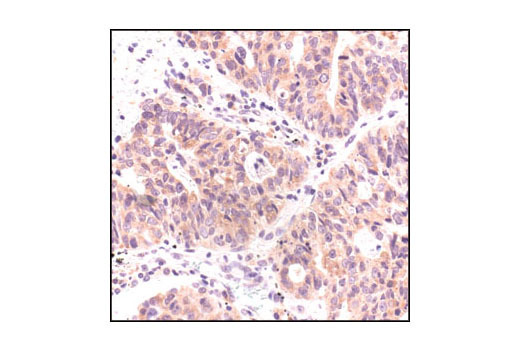 Immunohistochemical analysis of paraffin-embedded human lung carcinoma, using APS Antibody. 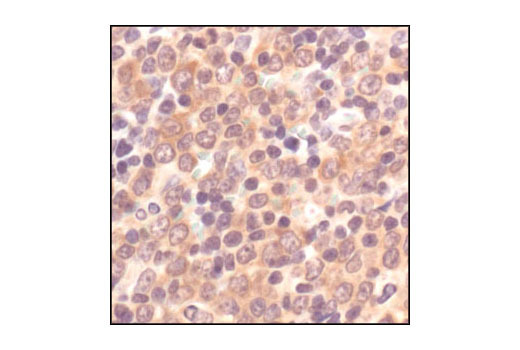 Immunohistochemical analysis of paraffin-embedded human non-Hodgkin's lymphoma, using APS Antibody. 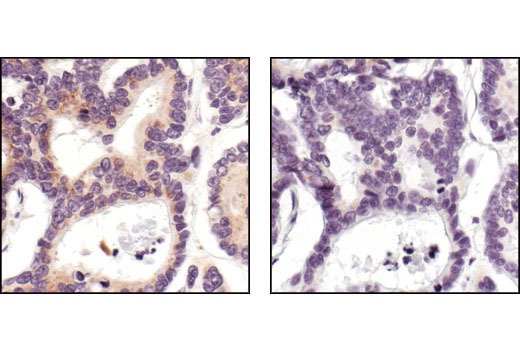 Immunohistochemical analysis of paraffin-embedded human colon carcinoma, using APS Antibody in the presence of control peptide (left) or antigen specific peptide (right). 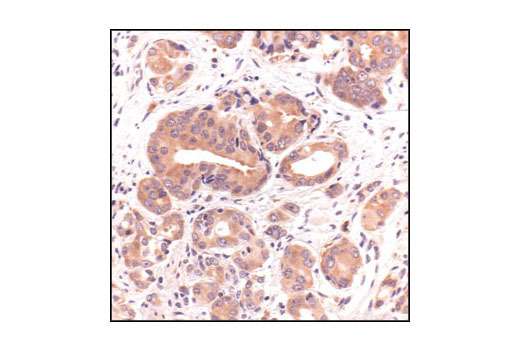 Immunohistochemical analysis of paraffin-embedded human prostate carcinoma, showing cytoplasmic localization using APS Antibody. 1X PBST: To prepare 1X PBST add 50 ml Phosphate Buffered Saline with Tween® 20 (PBST-20X) (#9809) to 950 ml dH2O, mix. APS Antibody detects endogenous levels of total APS. This antibody does not cross-react with other adaptor/docking proteins. Polyclonal antibodies are produced by immunizing animals with a synthetic peptide corresponding to residues near the amino-terminus of human APS. Antibodies are purified by protein A and peptide affinity chromatography. APS is an SH2 and PH domain-containing adaptor protein closely related to Lnk and SH2-B (1). APS was identified as a substrate for many receptor tyrosine kinases including TrkA, insulin receptor, c-Kit and PDGF receptor (2). Tyrosine phosphorylation of APS provides docking sites for downstrean signaling components, mediating diverse signaling pathways. APS plays quite different roles in RTK signaling. Overexpression of APS has been shown to inhibit PDGF-induced mitogenicity, which may result from APS/c-Cbl-mediated PDGF receptor degradation (3). However, APS promotes enhanced mitogenicity in response to insulin stimulation (4). The striking difference in APS-mediated signaling between the different RTKs could lie in the mode of interaction with the respective receptor. Liu, J. et al. (2002) Mol. Cell. Biol. 22, 3599-3609. Qian, X. and Ginty, D. (2001) Mol. Cell. Biol. 21, 1613-1620. Wollberg, P. et al. (2003) Biochem J 370, 1033-8. Ahmed, Z. and Pillay, T.S. (2001) Biochem. Soc. Trans. 29, 529-534.